Built into the iPhone’s camera app is the ability to take pictures of tall buildings, wide for the interiors of a restaurant, simple HDR for vivid lights and even wrap around panoramic images. All of this ‘built-in’ so why do we need apps for taking pictures outside of what Apple provided? Mostly, because one solution isn’t the ‘best’ solution for everyone. Photos taken and left exactly as they are is fine, but many times there is a vision of what the photo could be so why not tune the image a bit. In the world of panoramic photography, there has been a nice list of app options, each with their own way of doing the action of taking the photos. The early solutions required a person snap a photo then align the next photo with the previous before hitting the shutter button, then the app stitched all the photos together. After that was solutions that had a grid area that a person took photos to fill in for the app to merge. 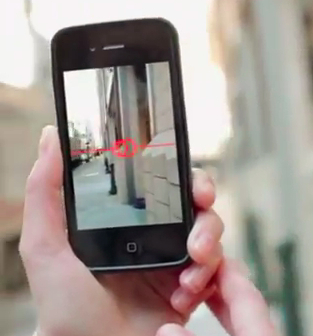 Most apps now use a graphic that two parts at the edge of the view finder which come together for the next photo to be taken. Cycloramic offers an simple, yet effective graphic to show when the next photo is being taken. The app doesn’t require alignment, it takes care of that for you. Unlike most other solutions is the ability to go back the reverse direction mid action if moving too fast for Cycloramic to have gotten a clean photo. The ability to move up/down slightly also gives more height to the resulting images too. If you have an iPhone 5 and a smooth/flat surface… Cycloramic will do all the work for you. A feature that put the app into everyone’s conversation when it was first introduced is how the app will vibrate the iPhone 5 to cause it to turn. Basically, place your iPhone 5 on it’s bottom edge, tap the button to take a photo, Cycloramic spins the iPhone and snaps photos as it goes. No add on hardware is required! In the most recent update is a new feature to have the panoramic photo converted to a movie. Sometimes you want to share a photo that people can move around the 360 photo. Generally though, the message of the environment is best delivered via a controlled view which a movie does. Cycloramic 2.1 does the stitching and conversion to a movie to export all in one app.